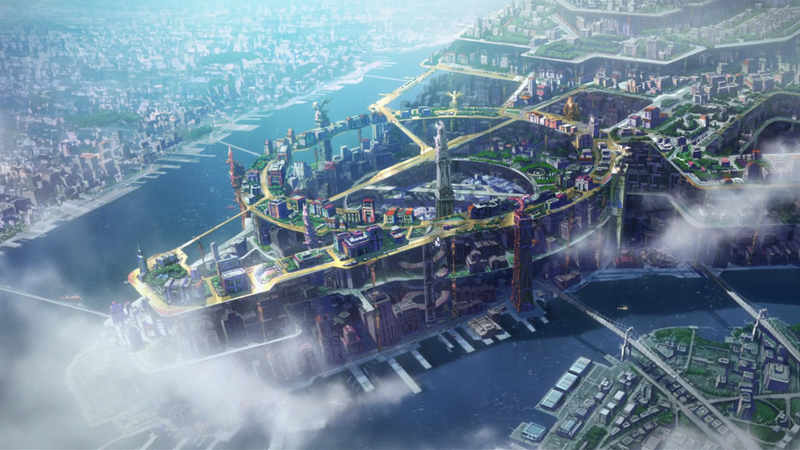 Futuristic city concept from animation, Tiger & Bunny. Nowadays, as the density of population in urban area grow, more and more problems arise. The spaces in urban area are crowded, unorganized, and even chaotic. Pedestrian, bikes, and cars run into each other; bizarre connections and wayfinding between public transportation systems add on to the suffer of the user. Air pollution, sound pollution, and light pollution worsen the user’s experience drastically. The lack of daylight and natural contact make certain area of urban environment inhumane. Traffic jam in LA. Cars releasing heat and exhaust. In San Francisco Bay area, sometimes BART trains that are running to different directions takes people from the same side of the same platform. All BART trains look the same, so passengers can only rely on small LED screens and quiet broadcast. Streets in Manhattan are usually in shade due to the tall buildings on both sides. Bicycles and cars may have to share the same lane in rush hours. People tend to J-walk in heavy traffic because of the everlasting heavy traffic flow. Planners, architects, designers, and artists have been looking for solutions for decades. Some of them were looking at the problem at a small scale, and have given answers that worked in context. For example, in Hong Kong financial district, roof gardens are popular hangout place for the public. Pedestrian are separated from automobiles by fly galleries between buildings. Public roof gardens, fly galleries and lifted walkways in Hong Kong financial district adds interests and delights to the public space. Sometimes it is hard to tell where the fly galleries leads to from inside. Photo by Shiqi Ming. However, when reducing the ground traffic by separating pedestrian from vehicles, wayfinding becomes a new difficulty, while problems including pollution and daylight left untouched, because the walkway designs are largely based on unorganized, individual design decisions. When the scholars study ecosystems, it is common to divide them into vertical layers. Take the Amazonian rainforest as an example, most of the larger animals, including birds and monkeys, are more active in the canopy, because there are more food and sunlight. Cities can be divided into vertical layers as well: layer of vehicles, layer of outdoor or public activities, layer of semi public activities, and layer of more dedicated and private activities. Right now, the street level of the cities are mostly at the same level as the physical ground. Architects and designers are digging underground for storage, mechanical and parking spaces, while building above to fulfill the needs of dense population. Cities like New York City thus exist: tall, skinny skyscrapers reaching to the clouds, blocking sunlight from people and public activities on the streets; complicated underground structure releasing unpleasant exhaust to the streets. In this case, the current most essential level for public and out door activities in many cities turned out to be a miserable place for people to even breathe. 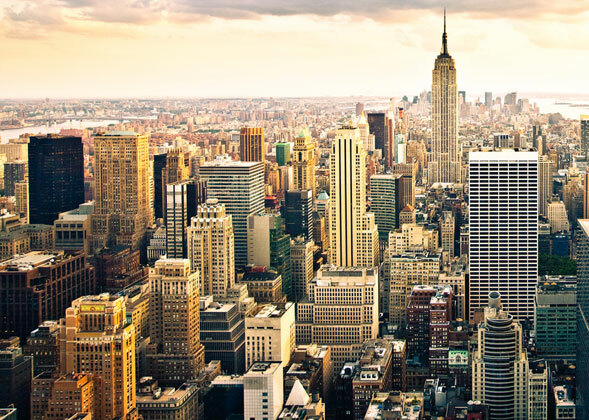 Us compared to buildings are smaller than bugs compared to grass. We are probably even more unfortunate – bugs can get on to grass tips, but we can not always get on to building tops. Then, instead of digging underground, why not lift up the street level? That way, we can leave the ground layer to programs that does not require much daylight and fresh air, such as parking, loading dock, waste, and mechanical, saving the money from expensive underground construction. Water and air cleaning system should also be in this level, only letting out clean water and air. The layer above the ground level could be the new “street” level, where most of the public and out door activities take place. It may take one to three stories, since some recreational space, such as theaters would take more than one floor. Instead of a solid surface, the street layer would be more similar to a net. It surrounds the building, and leave opening for space underneath to have daylight and ventilation. Friends may hangout, go shopping, chat and eat along the path. Restaurants and entertainments would locate right at the “street” level, where it is the easiest to access. Bicycle lane could also be on the same level, without worrying about air pollution. After that, comes a semi public layer, where there are open space for neighbors to greet each other in a more secured community lounge, or colleagues making insiders’ jokes during lunch time in the firms outdoor café. The top layer may be the thickest layer vertically. Offices, hotels, and private residential spaces would be included in this layer. People would be far enough from noise, and enjoy privacy, daylight and natural ventilation. Green space should be included in all layers and allow native animals and plants to regain their habitats. All in all, lifting up and organize layers of urban space could be a possible solution to build future cities. “8 Cities That Show You What the Future Will Look Like.” Wired.com. Conde Nast Digital, n.d. Web. 26 Aug. 2016. “Global Green Cities.” Global Green Cities. N.p., n.d. Web. 26 Aug. 2016.